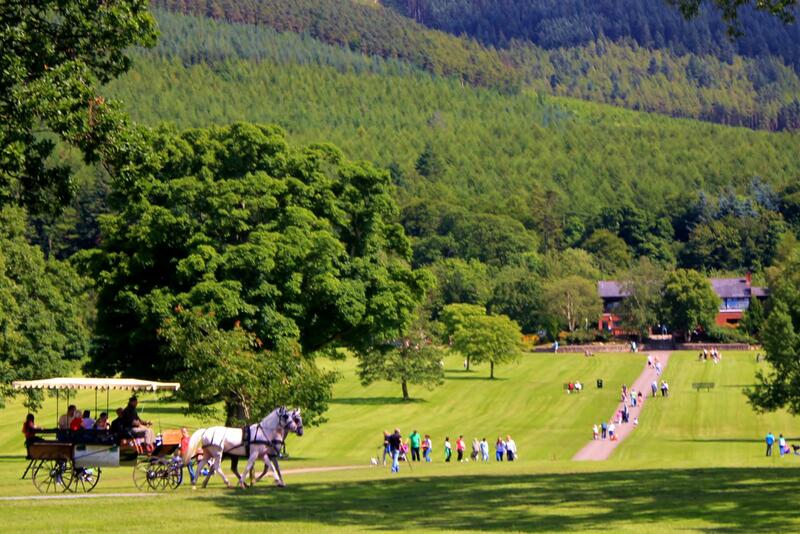 There are few parklands in existence which could surpass the beauty of Kilbroney Park. Here mountain, stream, sea-lough and valley conjure up a scenic wonderland. The 97 acres which form Kilbroney Park lie close to the shore of Carlingford Lough in the shadow of the forest-clad Slieve Martin. As a backdrop to Kilbroney Park stands the impressive 4,000 acre Rostrevor Forest rising sharply from 30m to 500m above sea level. Planted in 1931 mostly with coniferous species, the forest has a breathtaking two mile forest drive providing panoramic views over Carlingford Lough, an old oak plantation dating from the 18th Century, the famous 40 tonnes “Cloughmore” or “Big Stone” and a host of animals ranging from grouse and irish jays to pine martens, red and grey squirrels, foxes and badgers. The Cloughmore car park at the end of the forest drive, 230 metres above sea level provides views of the surrounding forest and is a good starting point for the three waymarked trails. The trails vary in length from 1.25 miles to 4.5 miles, and take the visitor to various areas within the forest to enjoy the many magnificent views and beauty of the woodlands. 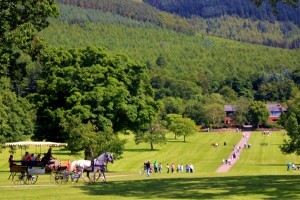 Tollymore Forest Park is located just outside Newcastle, and is a beautiful place to head out for a walk. With various marked routes, the longest is an 8-mile loop, bringing you up by the viewpoint, from where you can look over the Mournes. The river trail is a popular walk, mostly on the flat, with many interesting features along the way. These include bridges, grottos, and caves, as well as the popular stepping-stones. Certain walks are more accessible for wheelchair and pram users. Details can be found on the map in the Forest car park. Directions: On leaving the cottages, turn right, at Hilltown take a right, and follow the signs to Newcastle. On passing through Bryansford village, you will see Tollymore Forest park on your right. Take a right turn at the end of the village, and the entrance for Tollymore is on your right hand side, about 500 m down the road. Facilities include car park, toilets, picnic tables, and great walks. Journey time is about 25 minutes by car. Entrance is £4.20 per car. Located next to the centre of Castlwellan Town, this large forest park is an ideal place to visit for those who want a flat walk. With a large lake, surrounded by a 4km path, it is a good route for those with prams, wheelchairs, or for children on bikes. For the tree lover, the walled garden has some impressive species. At the end of the walk, visit the maze beside the carpark, children will enjoy racing to centre and ringing the bell. Facilities include toilets, picnic table, a café, an adventure centre onsite, the Peace Maze, and wheelchair accessible paths. Directions: On leaving the cottages, turn right, and head to Castlewellan (signposted). In the centre of the town, the entrance to the forest park is on your left hand side. Journey time is about 25 minutes by car. Entrance is £4.20 per car. Another large Forest Park, located on the road towards Armagh. The Park has 240 hectares of diverse woodland and rolling parkland, set in gentle rolling drumland. Gosford has a rare animals area, heritage poultry, and red deer. There are 4 way-marked trails of varying length, which wind through the forest. All trails are on a circular route and are well signposted. There are also shorter walks through the Arboretum and Walled Garden area. If you have bikes with you, bring them for gentle trails around the park. There are toilets and picnic facilities. Directions: Head towards Newry, and follow the signs to Armagh. After passing the village of Markethill, the entrance to Gosford is on your right hand side. Entrance is £4.20 per car.